SFoodie is among the throng regretting SF City Attorney Dennis Herrera’s successful effort to pressure Coors into removing essentially all of the active ingredients (caffeine, taurine, guarana, and ginseng) from their energy drink Sparks. 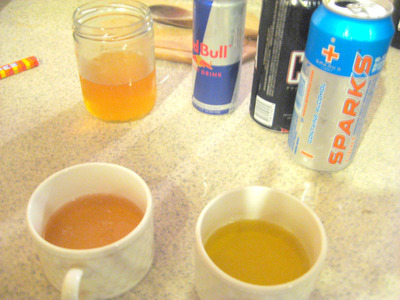 The [resulting] drink was reverse-engineered from a vintage can of caffeinated Sparks and rigorously tested via blind taste-test by SFoodie and four people who agreed to come over to the author’s house and drink this stuff, plus two random guys on the street who should be applauded for their daring and general zest for life. The results? It’s virtually impossible to tell the difference between Bathtub Sparks (or Not Sparks, or Moonshine Sparks) and real Sparks. Between tastings, palates were cleansed with beer. A side-by-side comparison. The one that looks more like urine is the actual Sparks. In other words, it tasted just like Sparks. Crush the Pez until reduced to a fine powder. Transfer the powder to the bottom of an empty glass. Pour in equal parts King Cobra and Red Bull. Don’t be alarmed when the foaming begins; it will subside. Adjust for flavor. 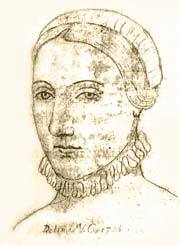 As we reach for the rush, we might raise it in a toast, as it was on this date in 1582 that the Pantheonic William Shakespeare, then 18, posted a £40 bond in Stratford-Upon-Avon for his license to marry Anne Hathaway (then 26)… Their first chid, Susanna, came quickly (six months later: What, Egg! Young fry of treachery! :-), followed in two years by twins.